Farpoint - Spread COM, List Pro, Input Pro, Tab Pro, Calendar Ojx, Button Objx, Spread for ASP.NET, Spread for Windows Forms Hong Kong/Asia Distributor, Reseller | Cogito Solutions Ltd.
For enterprises requiring development on both .NET and ASP.NET platforms, FarPoint offers a spreadsheet solution that combines its best selling products at a discounted price. Combined in one package for enterprise development, both FarPoint Spread for ASP.NET and FarPoint Spread for Windows Forms gives you spreadsheet/grid capability for data intensive applications with fantastic design customization capability. Discover the wealth of features with FarPoint Spread across platforms. When you need the most functionality and customizations for front-ends to database applications, turn to FarPoint Spread for Windows Forms. FarPoint Spread for Windows Forms provides endless customization options without sacrificing the speed and performance you require. FarPoint Spread for ASP.NET provides a feature-rich, AJAX enabled spreadsheet for use in ASP.NET and ASP.NET 2.0 development for responsive Web applications. 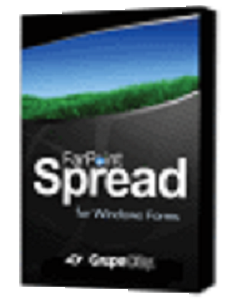 Why Buy Spread for Windows Forms? Spread introduced a number of technologies to Microsoft developers all over the world for the very first time, including the first full-featured spreadsheet component for Visual Basic, with the first spreadsheet designer, followed by Microsoft Visual Studio® .NET versions, and an array of new Excel-compatibility features and advanced customizations. You can import data from and export data with formatting to Microsoft Excel, for individual spreadsheets and entire workbooks. Spread supports several versions of Excel and several file types, including Excel files (XLS, XLSX), comma-delimited files (CSV), and text files (TXT). Spread for Windows Forms 5 now includes full-featured 2D and 3D charts. Chart types include Column, Line, Pie, Bar, Area, XY, Bubble, Stock, XYZ, Doughnut, Radar, and Polar. You can add charts using code, the Spread Designer, or the Chart Designer. You can also bind charts and let the end user make changes to the chart at run time. The fully integrated charting support in Spread features built-in menus and dialogs that you can use, and allow your end-users to use, for creating and modifying charts in the spreadsheet just as you would in Microsoft Excel. Spread is the world's most powerful spreadsheet component for .NET. It offers an extensive code-behind, event-based API, plus the ability to customize almost any element of the user interface or application behavior at run time. Developers have long used Spread to embed advanced Microsoft Excel-compatible spreadsheet features into their .NET applications — features that would otherwise be considered impossible to achieve. Spread comes with an easy-to-use, intuitive spreadsheet designer that makes designing detailed spreadsheets and user screens a snap without writing a single line of code. Whether it is designing new screens or editing existing ones, the Designer’s new ribbon tool bar interface makes it easy to do so using a Microsoft Excel-like, visual, drag-and-drop user interface. The provided Chart Designer makes it easy to design stunning charts and spreadsheet dashboards by allowing almost unlimited customization of your charts. Spread allows you to bind to a variety of data sources — including run-time unbound data. It supports binding spreadsheets to enterprise databases and .NET collections such as data sets, data views, and data tables, and any BindingSource object or other object that implements the IList or IListSource interface. You can also bind a sheet, column, or cell range. You can customize the printing of your spreadsheets with many different printing options. For example, you can have colors and images in headers and footers. You can print parts of the sheet as needed. You can also print to a Portable Document Format (PDF) file. You can even take charge of the printing in your code using the owner print drawing support. More than a decade ago, Spread became the first spreadsheet component to work inside the Visual Basic IDE. Since then, the COM version — and now the .NET version — have not only been used by tens of thousands of developers, but also have become one of the only spreadsheet components to be successfully localized, sold, and supported in Japan, Europe, and the United States. When you buy Spread for Windows Forms 5, you get access to not just a powerful Windows Forms component, but a number of additional tools and features. These include the Spread Designer Tool, complete with Microsoft Office 2007-style look and feel, the Chart Designer, FormulaTextBox and FormulaProvider, Microsoft Visual Studio-integrated designers and property editors, charts, Microsoft Excel import/export APIs, and a comprehensive SDK. If you admired Spread for its world-class quality, powerful features, and tools, you will love version 5 even more. The new version contains a number of improvements to enhance the performance and quality of the spreadsheet engine, making it better, faster, and smarter than ever before. When you buy Spread products, you are getting a market leader. You are getting thorough documentation. You are getting technical support and expert advice. You are getting the confidence of knowing that for the last decade, over 100,000 developers have adopted and enriched the product with their experience and skills, and have contributed to a global online knowledge base in the form of innumerable forum discussions, articles, comparisons, blogs, and emails. Add full-featured spreadsheet capabilities to your ASP.NET applications - now with Charting! The world’s most popular ASP.NET spreadsheet component...now with Charting support! Use our ASP.NET spreadsheet component to add full-featured spreadsheet capabilities or highly advanced grid functionality to your ASP.NET applications. Our award-winning Spread for ASP.NET frees you from spending tedious hours coding features that are missing in other grids. In Spread for ASP.NET many of those features are only a property setting or line of code away. Take the product tours, read the whitepapers, or download your evaluation today. Spread for ASP.NET is a complete ASP.NET spreadsheet component that supports bound or unbound modes (no dataset needed), AJAX, native Microsoft Excel import/export, in-cell editing, multiple edits on multiple rows without server round trips, client-side column/row resizing, multiple sheets, searching, filtering, multiple cell types, validations, cell spans, multiple headers, sorting, complete customization at the cell level, over 300 built-in calculation functions, hierarchical display and much more. Written from the ground up in C#, you can be assured Spread for ASP.NET will provide your ASP.NET user with an easy and reliable, feature-rich, user-friendly online experience while giving you the extensive spreadsheet feature set you expect from a FarPoint Spread product.